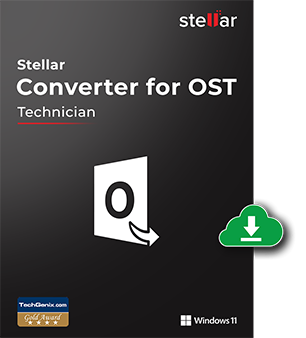 Stellar Converter for OST Technician is a comprehensive solution that not only converts Outlook OST files into PST files, but also facilitates compaction and splitting the PST files before saving. After conversion, the converted data is saved in a new working PST file that can be imported directly into MS Outlook to regain access to the mail items. I needed a tool to access my important business emails. Before choosing Stellar, I used another third-party product to convert 10 GB OST file. But it failed miserably. While Stellar OST Converter successfully converted all my inaccessible OST items. This Converter worked; the software showed all the mails items in the preview section. Thanks for your product! Equipped with several advanced options, it converts orphaned Outlook OST files to PST files. The software extracts all inaccessible mails, calendar entries, contacts, tasks, notes, journal, etc. in their original form and exports them to a working PST. This advanced converter facilitates you to find and view mail messages based on the criteria – Date, From, To and Subject, which helps in selecting the right mail items for conversion. In addition, it also allows you to save the converted files in Office 365, DBX, MBOX, MSG, EML, RTF, HTML, and PDF formats. Compress all attachments in the newly created PST. Extract, compress and save attachments to a folder. Remove all attachments in the new PST file. Extract and save attachments to a new folder, without the loss of the interlinking. For splitting by ‘Mail ID’ option, you should select at least one mail Id for splitting the PST file. Splitting by Date range, will create a single PST file which will include those mail items of the date range set by you. Splitting by ‘size’ enables you to split a large PST file by pre-defined sizes. Batch conversion feature supports the conversion of multiple OST files into their corresponding PST files at same point in time. Allows saving the PST file at the source destination as well as at preferred location. File conversion is accomplished using two options - “Convert Mailbox” and “Convert & Split Mailbox”. Start the Batch Conversion process with either “Drag & Drop OST” or “Add OST” option and add as many OST files. Or “Find OST” option, if OST location is not known. Convert and save all OSTs of Batch file directly at source location by selecting the “Convert Mailbox” option. Click on “Click Here” button to save PST files at preferred location. “Convert and Split Mailbox option” enables splitting the PST files on the basis of either “Split By Date” or “Split By Size” option. This tool selects and converts OSTs and the converted files are directly exported to Office 365. Exporting PST files to Office 365 is particularly beneficial in those cases where organizations shift from on-premises Exchange to Cloud Office 365 wherein this software ensures easy and smooth mailbox migration. With Office 365 Account, converted OST files are directly exported to Office 365 by simply selecting Office 365 as an option and entering its login credentials. Save and Load scan lets you manage the scanning and saving time by allowing a time-lapse between scanning of OST file and saving of converted file. Download the free version of Stellar OST Converter software and scan the OST file. Verify all components of converted OST file and save the scanned information as DAT file at preferred location. Next, register the software, load the Saved scanned information available in the form of DAT file, and without undergoing the scanning procedure again, save the converted file in preferred format. The New look software is easy to understand and promotes intuitive working as the User interface and User Design bear a resemblance to MS Outlook interface. The clutter-free clean interface displays commonly used menu-icons on the top and allows a smooth functional flow of all the tasks. OST Conversion tool for Technicians allows you to select a desired name to save the converted PST files. This feature will make it easier for you to remember the folder name as well as the location of the new PST files. What does the free demo version of the software do? The demo version of the software is for free evaluation and analysis. Using the demo version, you can scan the OST file (even a corrupt one), preview all mail items and save 20 items per folder. To save the converted file as PST, or to compress, or split before saving, you need to register for the full license. Can I export contacts to CSV file with demo version? Yes, you can export all contacts present in your OST file to CSV file but some important fields will be filled with "Demo" string. I have converted the OST file, but unable to open the file in my MS Outlook. Please follow the following steps, if you are facing the problem. To view a newly created PST file with the software, you can either import the PST file in MS Outlook or follow the steps mentioned below. I have an over-sized OST file of more than 2 GB. Can I convert this file with Technician edition? Yes, with Technician version, you can convert over-sized OST files. The good thing with the software is that you have the option to split the converted over-sized file at the time of saving it. What is the time taken to convert my OST file with Technician software? The time to scan the OST file depends primarily upon its size. You can view the progress bar during scanning that indicates that the process is going on. After the process is over you will get a message - 'Scanning of selected OST file completed'. How can I find my contacts from the converted OST file? To locate and access the contacts; first, you need to import the new PST file to MS Outlook. Then follow the steps mentioned below. Under the 'Look For' tab, select 'Contact'. You can now see all the contacts. Can I view and save the log report of the entire process? Yes, you can view and save the entire Log of the process followed during the software run. Follow the steps mentioned below. Stellar Repair for Exchange is the most recommended software by MVP’s. It repairs corrupt Exchange D..
Stellar Converter for EDB is a professional tool that proficiently converts online as well as offlin..
Stellar Toolkit for Exchange helps Exchange Administrators to repair corrupt EDB files, extracts ina..